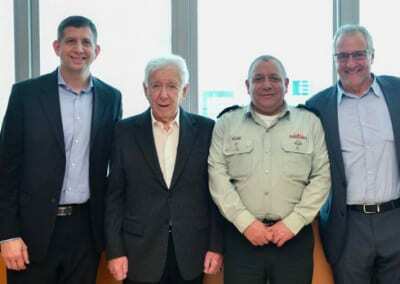 Frank Lowy has been honoured by Keren Hayesod with a special meeting in Jerusalem with former IDF Chief of General Staff Lt. General (Res.) Gadi Eizenkot. Lowy fought with the Golani Brigade’s 12th Battalion during the War of Independence in 1948. Eizenkot is also a former soldier of the same brigade. Sydney-based Lowy is a recipient of the Nadiv Award, one of Keren Hayesod’s highest honours. He is a dedicated and generous supporter to the State of Israel and Keren Hayesod.